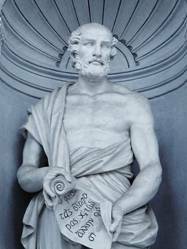 Theophrastus was born in 370 B.C. and was a student of Aristotle, who bequeathed to Theophrastus his writings, and designated him as his successor at his School. He was a scholar, botanist, biologist, and physicist. The most important of his books are two large botanical treatises, Enquiry into Plants, and On the Causes of Plants, which constitute the first systemization of the botanical world and were major sources for botanical knowledge during antiquity and the Middle Ages. On the strength of these works some call him the "father of botany." These books documented types of plants commonly used at the time, and described attempts to cultivate wild plants. Theophrastus developed his own vocabulary to describe plant processes and horticultural and agricultural efforts. He was concerned about the many species of unidentified and unknown plants of the wilderness. He commissioned his students and staff to collect specimens and conduct experiments as they worked, which helped to determine which plants could be put to various uses. The Enquiry into Plants was originally ten books, of which nine survive. 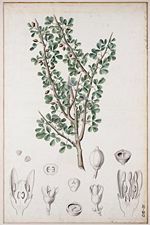 The work is arranged into a system whereby plants are classified according to their modes of generation, their localities, their sizes, and according to their practical uses such as foods, juices, herbs, etc.http://en.wikipedia.org/wiki/Theophrastus - cite_note-Long1842-43 The first book deals with the parts of plants; the second with the reproduction of plants and the times and manner of sowing; the third, fourth and fifth books are devoted to trees, their types, their locations, and their practical applications; the sixth deals with shrubs and spiny plants; the seventh deals with herbs; the eighth deals with plants which produce edible seeds; and the ninth deals with plants which produce useful juices, gums, resins, etc. On the Causes of Plants was originally eight books, of which six survive. It concerns the growth of plants; the influences on their fecundity; the proper times they should be sown and reaped; the methods of preparing the soil, manuring it, and the use of tools; of the smells, tastes, and properties of many types of plants. 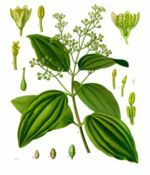 The work deals mainly with the economical uses of plants rather than their medicinal uses, although the latter are sometimes mentioned. Although these works contain many absurd and fabulous statements, as a whole they have many valuable observations concerning the functions and properties of plants. 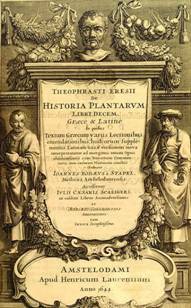 Theophrastus detected the process of germination and realized the importance of climate and soil to plants. Much of the information on the Greek plants may have come from his own observations, as he is known to have travelled throughout Greece, and to have had a botanical garden of his own; but the works also profit from the reports on plants of Asia brought back from those who followed Alexander the Great. To the reports of Alexander's followers he owed his accounts of such plants as the cotton-plant, banyan, pepper, cinnamon, myrrh and frankincense.